The bard is a storyteller, a sharer of experiences. So, it is fitting that my first experiences with a sauna were often filled with bards. Not in a figurative sense, but a literal one. The host was Norm Wheeler, a Beach Bard: storyteller, teacher, musician. Each week, Wheeler would religiously fire up his sauna and invite guests over for dinner. His guests were friends and family, and often included his fellow bards—a group of storytellers, authors, teachers, deviants, and philosophers. Back in high school, I had made fast friends with the sons of some of the Beach Bards, and so I had a standing invitation to join the weekly saunas. * As a fairly uncultured boy from small-town Frankfort, these evenings of philosophy, politics, literary references, and adult humor were intimidating, enlightening, and exhausting. The dinners after the sauna were always filled with homemade food, expensive cheeses, and wines from around the world. This was not the epitome of a bourgeoise dinner, as the guests were teachers, builders, cherry-sellers, artists, rogues, small-business owners (these are not mutually exclusive)—essentially guests who chose to spend their hard-earned money on a shared experience. It was an occurrence that has gone back through time, perhaps to civilization’s very beginning: the young initiating into the adult world through fire, steam, smoke, and ritual dinners. The sauna (pronounced “sow-na,” like a female pig), for those who are not familiar, is an ancient tradition that goes back really, really far and crosses multiple cultures, and, well, that is not really important at this point. It is the experience that is important—heating the body to high temperatures, then rapid cooling, or slow cooling. Whichever you prefer. The sauna is a heated structure, generally the size of a small shed; it is purposefully small, so as to contain the heat. In this tiny building is a stove, often wood-fired. Upon the stove are loose rocks. The room heats up. The rocks heat up. People climb in (sometimes naked), and then water is tossed onto the rocks, creating a steam. The steam in the air then transfers the heat to your body, creating a near-instant feeling of increased temperature. (For the wonky among our readership, it is called convective heat transfer.) Traditional saunas are hot. The Bards, of course, like a hot sauna: 200 degrees Fahrenheit. At 200 degrees, when you throw water on the hot rocks, you can barely breathe. Inhaling through the nose feels like your nose hairs are burning off, so you take short, quick breaths through the mouth. This is a good experience. Others like a cool sauna—160 degrees or so; you can sit for a long time in a sauna this temperature. The best way to rapid cool is to jump in a body of water—a river, a stream, a pond, a lake—but oftentimes a bucket of cold water over the top of the head will do just fine, making your heart skip a couple of beats and have you questioning your life choices. A moment later, a sense of euphoria (or perhaps just the joy of a renewed heartbeat) will rush over you. A snowbank is, surprisingly, a middle ground; the snow cools your body, as your body melts the snow. Some like being beaten with birch boughs. Not boughs, really; more like twigs with the leaves still on them. Choose your partner wisely. A gentle slap of a bough on the super-heated skin is mostly pleasant. The constant cleaning (heat, water, heat, water, heat, water) means the sauna experience is one that gets you cleaner and cleaner as you sauna. Some folks will tell you about the health benefits, too. About the sweating out of “toxins.” If that tickles your fancy, then go for it. To me, it is just a pleasant experience that should never be done alone. Matt Nahnsen is the Sauna Dude. I have known him for many years. (A stinking advertisement?! What can I say: when you love something, or someone, you promote it/him. And, I own a newspaper, so…) I would list all of the things that Nahnsen does, but that would lead you to all sorts of assumptions (and that is assuming that you do not already know the guy). What is relevant, above all else, is that he is a good person and an enjoyer of life. He tells stories, he knows people, he shares his life experiences, he is open and honest. If he is not a true bard, he is close; so bard or dude, he is, for me, a continuation of something that truly makes me happy—the joy of a good sauna with good people. The Sauna Dude’s mobile sauna is 12 feet long and can hold eight people (six comfortably). Rental includes firewood, essential oils, and delivery. Image courtesy of Noah Sorenson. Earlier this year, in a fit of passion, Nahnsen purchased a mobile sauna (and then a big truck to pull it around). It can go almost anywhere, and we have taken it to a few boat launches (Crystal Lake, Betsie River), and enjoyed the death-defying dip in April waters—there was still ice on most of Crystal Lake when we dove in the shallow waters. A scream is often appropriate in these moments. Nahnsen has created a website and a Facebook page for his mobile sauna, and it is already gaining quite a following. He rents the sauna out by the day, the weekend, or the week—$325 for a day, $475 for three days, or $825 for a week. (Yes, I know, a stinking advertisement.) It comes with all the firewood you need, plus some essential oils; it can be dropped off anywhere, and Nahnsen is someone who will make sure that you have a wonderful experience. You have full control over the experience. Go fully naked, or covered in a towel, or fully clothed (if that is your thing). Share with family, or friends, or strangers. Make it a bachelor/bachelorette party, a weekend meditation, or a star-gazing/midnight sauna, and then dip into your favorite body of water to cool off. After each use, the sauna is cleaned with baking soda and water, and then it is sanitized with hydrogen peroxide. The sauna is made of cedar, so, combined with eucalyptus, it has a very pleasant smell. Water, earth, fire, wind—it may sound downright cliche, but it will, in the end, help you to pause all other thought and just think/meditate. Or scream. Both are good. 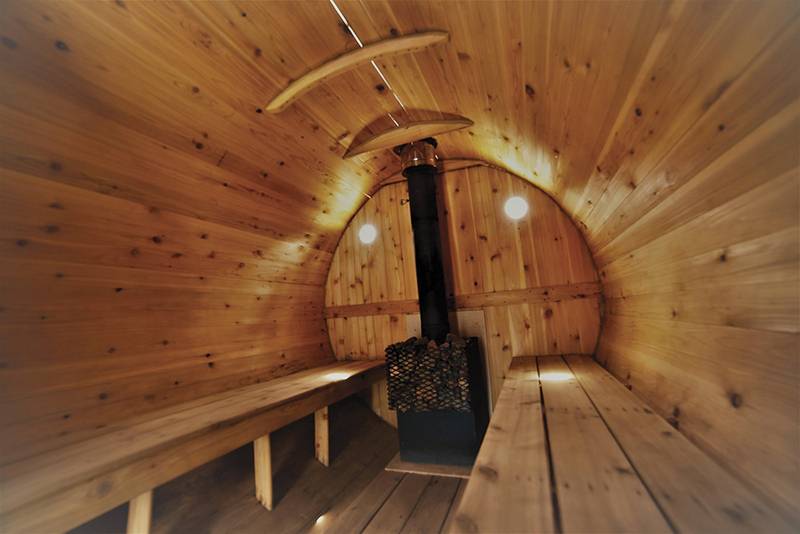 The mobile sauna is 12 feet long, with an attached changing room, and it can hold eight people (six very comfortably). For more information, visit SaunaDude.com or call 231-651-0287. 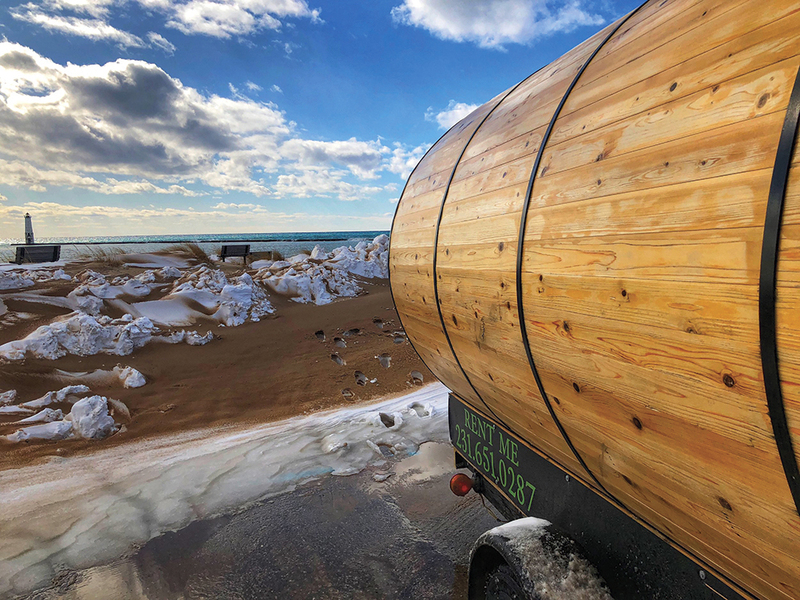 The mobile sauna was built by The Sauna Guys (TheSaunaGuys.com) in Pelkie, Michigan, which is located near the base of the Keweenaw Peninsula. *In case you have never been, the Beach Bards Bonfire is a weekly gathering during the summer on Lake Michigan at The Leelanau School in Glen Arbor. The event begins every Friday at dusk, and it has been going for more than 30 years. Open to the public, anyone can perform poetry, songs, and music, with the only rule being that you must know it by heart if you plan to perform—no reading! Or just come and enjoy the performances of others. Editor’s Other Note: It was at one of Norm Wheeler’s weekly saunas that the name The Betsie Current was workshopped and approved! Editor’s Final Note: Jacob Wheeler founded the Glen Arbor Sun in 1996 and was essential in making The Betsie Current successful.